The Federation Pavilion in Cabarita Park provides a special link with the beginning of the Commonwealth of Australia. The pavilion was built as the focal point for the Inauguration of the Commonwealth of Australia in Centennial Park, Sydney on 1 January 1901. The original pavilion in Centennial Park stood 14 metres high on a slab of polished granite and was covered with ornate details rendered in fibrous plaster. After the ceremony, the plaster was removed and the wooden structure began to fall into disrepair. 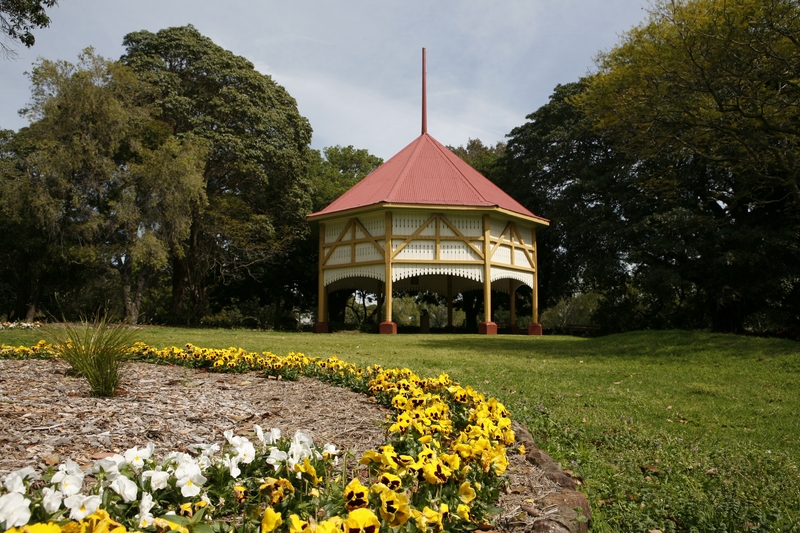 In 1903 the remains of the structure were purchased by Concord Council for £60 and moved to Cabarita Park. The granite platform was embedded into the ground at Centennial Park in 1904 to mark the exact location of the Inauguration ceremony. Over the years the Federation Pavilion at Cabarita has been the focal point of many community and private functions. In December 1935, it was the venue for the formation of the Concord 12 Foot Flying Squadron, later renamed the Abbotsford 12 Foot Flying Squadron. More recently it has become popular as a venue for weddings. Drummoyne Public School opened on 7 April 1886 with 32 students. 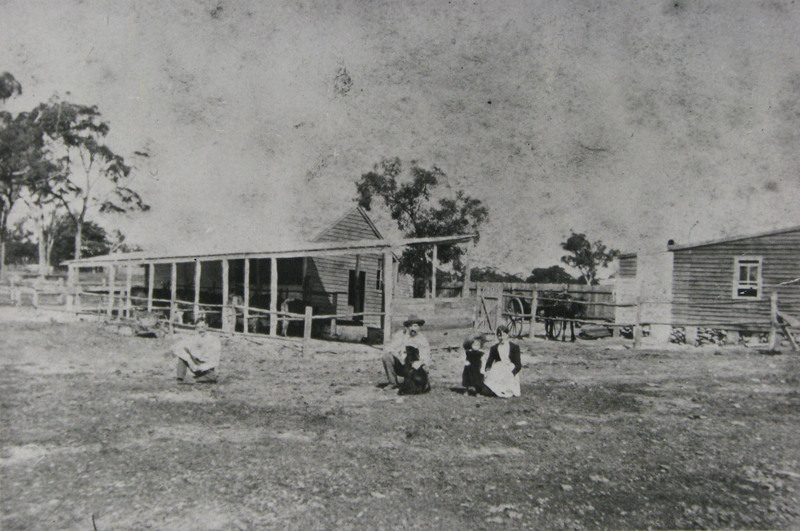 The school’s first building was a temporary wooden structure. This was later replaced by a brick building which could accommodate 170 students. More buildings were added as student numbers continued to grow due to the rapid increase in the population of Drummoyne in the early 1900s. In 1910 Drummoyne Public School became the first school in NSW to be provided with an Assembly Hall. However, by the time it had been completed, the increase in student numbers meant there was a shortage of classrooms. The new Assembly Hall was divided into four open classrooms, one of which had a seating capacity for 64 students. 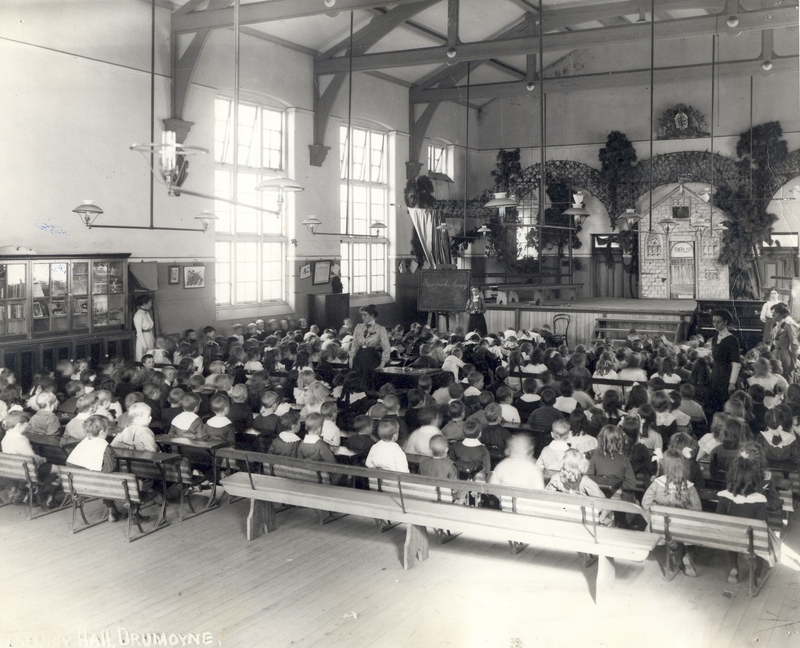 The photograph shows the infant class being taught in the Assembly Hall in 1910. The writing on the blackboard reads, ‘Bees make honey’. Lesson plans were simpler a hundred years ago. 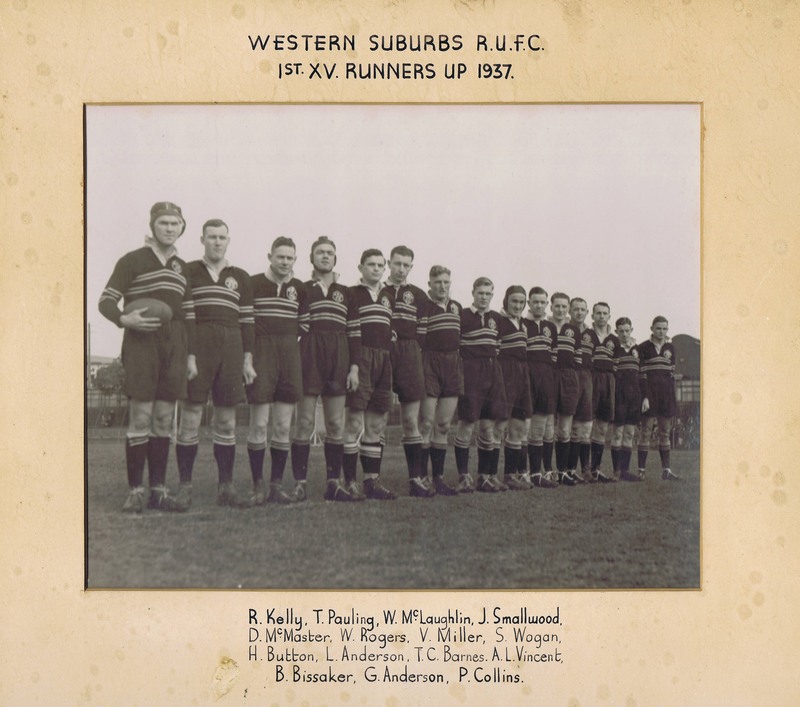 Local resident Harry Kimble’s passion for rugby led to him writing Against the odds: a pictorial history of Wests Rugby which covers 112 years of the Western Suburbs Rugby Club and West Harbour Rugby Club. Harry has been associated with Wests for more than half of its history, having begun as a ball boy in 1952. Since then he has been a player, video cameraman, committeeman, archivist and club historian. A passion for rugby runs in the family with his father, nephews and grandsons also playing for Wests. Harry donated copies of the 350 photographs used in the book to be added to Canada Bay Connections image library. The photograph above shows an impressive line-up with, left to right, Russ Kelly, Tom Pauling and Bill McLaughlin all of whom were Wallabies. Russell Lindsay Frederick Kelly served at Tobruk during World War II where he was wounded and captured. Following a prisoner exchange with Germany he returned to Australia in 1943 but died that year at Concord Repatriation Hospital, aged 34 years. This year marks the 150th anniversary of the New South Wales Police Force. In 1862 the various independent police units throughout New South Wales were combined under the Police Regulation Act to form the New South Wales Police. A Police Station was established at Five Dock in 1876 initially with a strength of one foot constable. 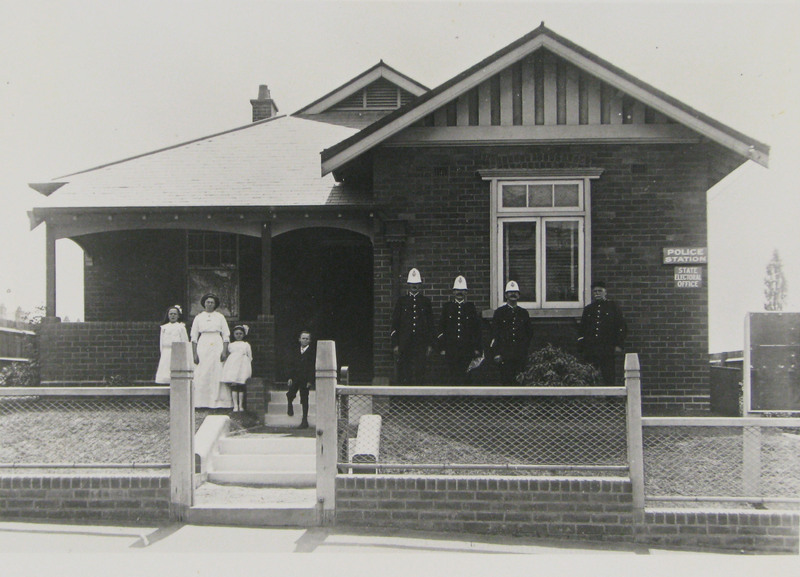 The Drummoyne Police Station was established in 1891 and had a strength of two foot constables. The photograph shows the Five Dock Police Station, Great North Road in the early 1900s. The station served as the home for the officer in charge whose family can be seen in the photograph. It was also the State Electoral Office. The station was located near present-day Fred Kelly Place and has since been demolished. Rhodes takes its name from the house built in 1823 for Thomas Walker (1791-1861) and his wife, Anna Elizabeth Blaxland. 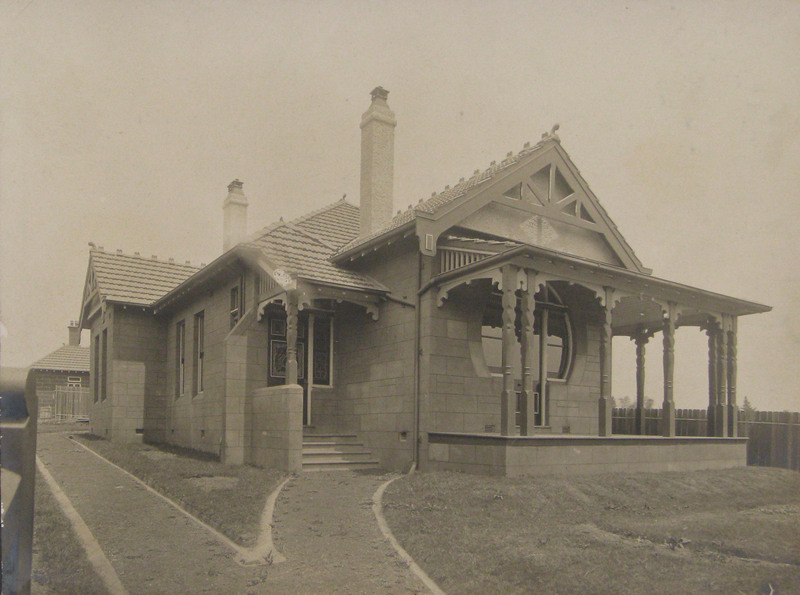 Rhodes House overlooked the Parramatta River near the northern end of Blaxland Road. It was named after his mother’s ancestral estate in Yorkshire. In 1832, Walker retired and went to live in Tasmania and the house was leased. 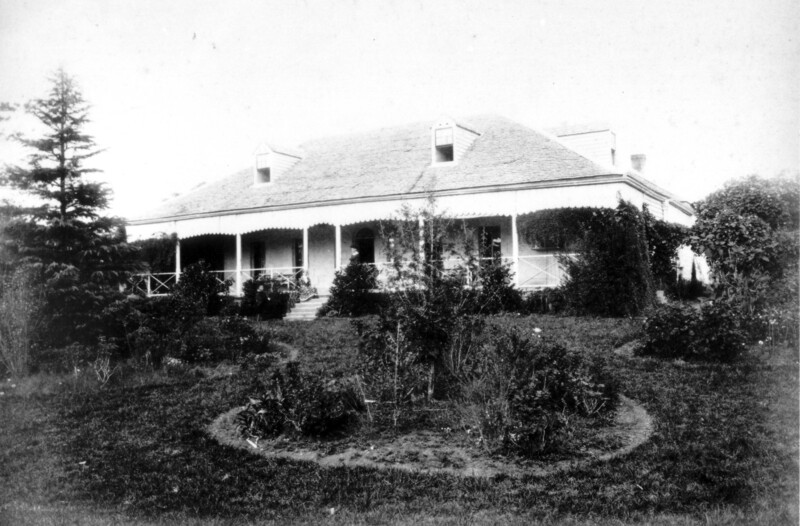 Anna Walker returned to New South Wales with her family to live at Rhodes House in 1870. After Anna’s death in 1889, three of her daughters continued to live at Rhodes. One daughter, Anna Frances Walker, established a reputation as a painter of native flora. Walker’s Estate at Rhodes was first subdivided in September 1895 with a further subdivision being made in 1910. Three streets in Rhodes commemorate the family’s association with the area: Walker Street, Blaxland Road, and Marquet Street, named after Anna’s brother, John de Marquet Blaxland. Rhodes House is believed to have been demolished in about 1918 to make way for John Darling & Son flour mill. It later became the site of Allied Feed Mills Pty Ltd which has now been redeveloped as a residential area. The first railway line between Sydney and Parramatta opened in 1855. Originally there were only four stations: Newtown, Ashfield, Burwood and Homebush. Redmyre Station, which is better known today as Strathfield, was added in 1877. Rail transport came to the Concord area in September 1886 when the northern line between Strathfield and Hornsby was completed. The first station along the line was at Rhodes. A year later in 1887, Concord Railway Station was opened. In 1909 the name was changed to Concord West. 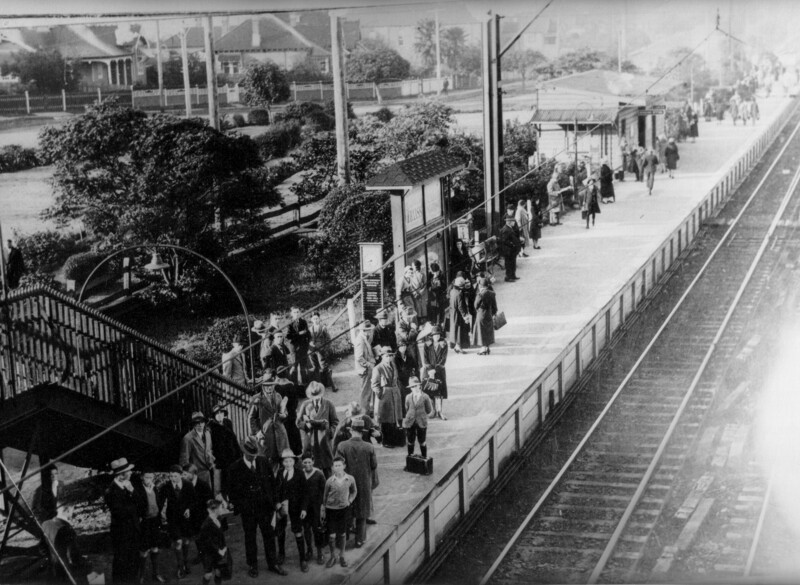 North Strathfield Railway Station was opened in 1919. The opening of the railway line provided the transport link necessary for the development of industry on the Rhodes Peninsular and at Concord West. The photograph shows Concord West Railway Station on 16 June 1933, a little before 8.30am. It’s quite a rare thing to be able to date an old photograph quite so precisely! Five Dock Public School began in 1861 with 36 pupils in a stone building in the grounds of St Alban’s Anglican Church. It continued as a denominational school until 1876 when it transferred to a new building with teacher’s residence in West Street, Five Dock. 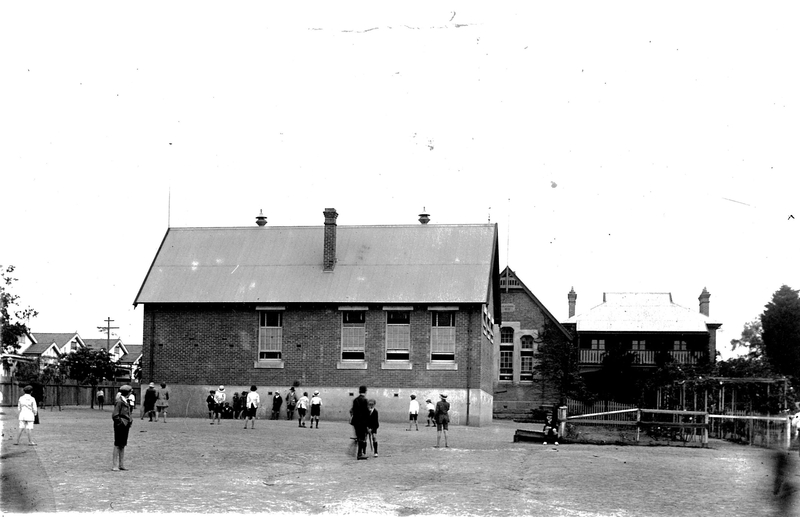 The photograph above is of the ‘Boys’ school’ in about 1921. A separate Girls’ department was established in 1920. To coincide with the 75th anniversary, Souvenir of the Five Dock Public School Jubilee, 1861-1936 was published, recording the early years of the school. This booklet is now quite rare so it has been digitised and added to Canada Bay Connections image library. What are your memories of Five Dock Public School? In 1905 Henry Goddard, later a Mayor of Concord, patented a building method called camerated concrete. This method allowed for the walls of a house to be constructed as one joint less cavity wall. Exhibited at the Royal Agricultural Show, it was claimed to be ‘practically indestructible, absolutely damp proof and better and cheaper than either brick or stone’. This claim has stood the test of time as the camerated concrete homes built in Ada Street, Concord still exist. The photograph is from an album of original photographs which were donated to Local Studies by architect Robert Irving several years ago. The photographs have now been digitised and can be viewed through the Canada Bay Connections image library. Today it’s hard to believe that Canada Bay was once a rural district with market gardens and dairies. There were several dairies in Concord, North Strathfield, Five Dock and Drummoyne from the 1890s through until the 1940s. Generally they appear to have been family operated dairies with a small herd of cows. Although the Yaralla Estate had a notable herd of prize winning Jersey cows. Livestock was sometimes a problem as urban growth increased. The Concord Council Annual Report of 1918 noted that 216 head of stock had been impounded during the previous twelve months and there were 18 prosecutions for cattle straying. The photograph shows a dairy in Renwick Street, Drummoyne about 1900. This year marks the 70th anniversary of the siege of Tobruk during World War II. Five Dock has long held a special place in the remembrance of Tobruk. The obelisk at the corner of Lyons Road and Great North Road was unveiled in 1968. It is modelled on the memorial at the Tobruk War Cemetery. Adjacent to the memorial is a row of trees planted by the Ladies of the Rats of Tobruk Association and the mast of the HMAS Vendetta which played a vital role in supply and reinforcement at Tobruk. 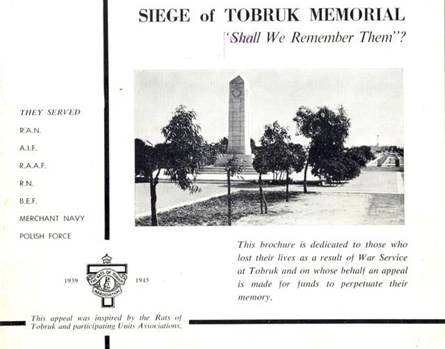 The Tobruk memorial has over the years been a meeting place for the veterans of Tobruk.